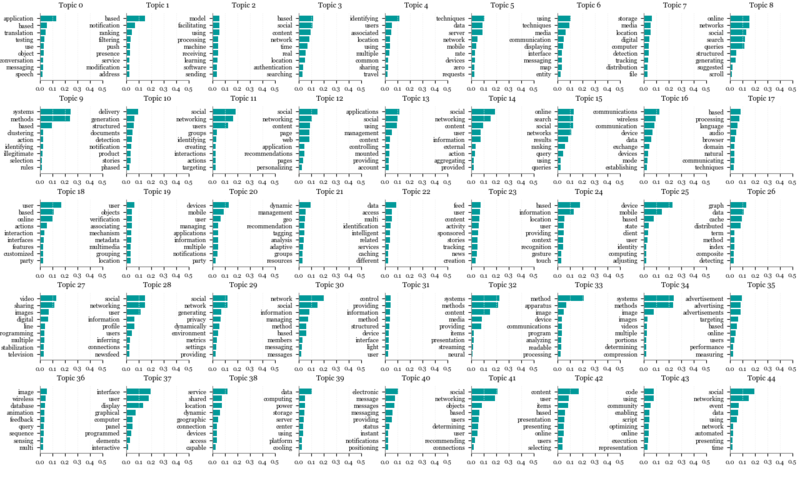 Topic modeling can be used in cluster analysis and that is the main reason why I wanted to understand how it works. It is based on the idea of a collection as a set of documents, which in their turn are made of words. Documents that are made of a certain group of words are likely to represent or belong to a certain topic. Words that are seen usually together are likely to constitute a topic. The frequency with which each word appears in relation to other words in a given document (inside a collection) is what constitutes the core of topic modeling. 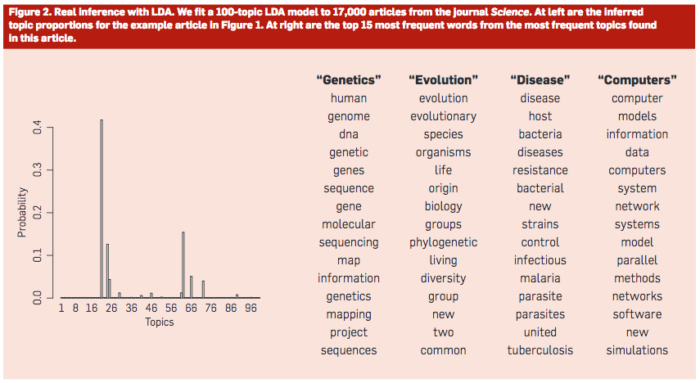 Latent Dirichlet Allocation (LDA) is the simplest possible topic model. The intuition behind it is that a document can belong to multiple topics – just like a blog post can be archived under many different categories or with different tags. The graphic below (taken from the paper ‘Probabilistic Topic Models’, by David M. Blei) illustrates this intuition. Each color represents a topic. 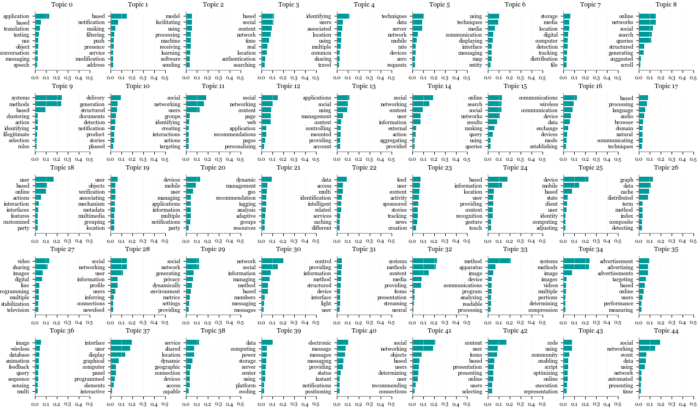 The graphic above illustrates what constitutes a topic: the words that occur more frequently (together) and thus can indicate a topic. 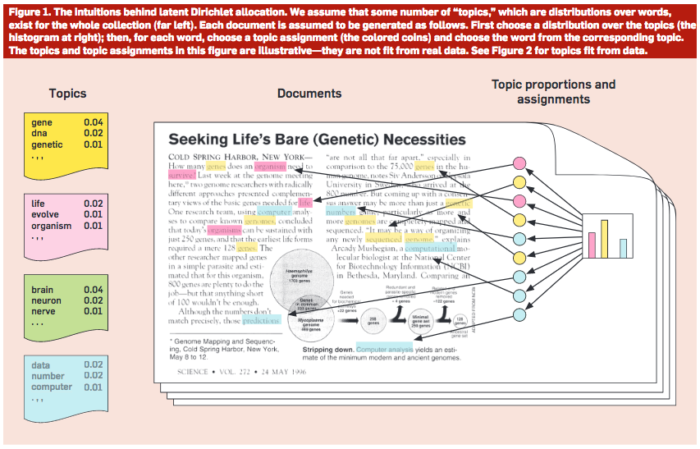 The chart on the left indicates the inferred topic proportions in the documents collection. In order to understand by doing, as a first step I decided to use the patents dataset as the collection from which to extract topics. There are many different modules (such as gensim, scikit) and methods (like LDA, NMF) to do that (as a reminder: Lídia and I have been using Python to explore and analyse data). All these possibilities can be quite challenging to someone who does not have a solid understanding of the statistical concepts that drive the technique, as the different ways to execute this task might be signaling that many factors play an important role in how it is executed. I opted to start by using Python’s LDA package, which is called as follows. So, clearly, the first noteworthy observation is: the number of words that one chooses to represent a given topic might influence one’s ability to recognize the word group as a topic. The number of words is technically not a parameter – but it definitely plays a role in visualizing the results and making the decision to move forward or change any parameter in the function. Actually, ideally the word would be accompanied by its weight within the group, i.e., how much relevance it has in the definition of the topic as such, or how the word scores within that topic. The next results will be graphically displaying this idea. The corpus of data representing Facebook’s interests can probably be understood in a broader range than three topics. So, I then tried with 9 topics: the results were a bit more diverse but still not clear enough. Comments, corrections and tips about this subject, and specifically about the experiments reported above, are more than welcome. Edited in Aug 3, 2018.